If you've never tried roasted beets, you're in for a delicious surprise. 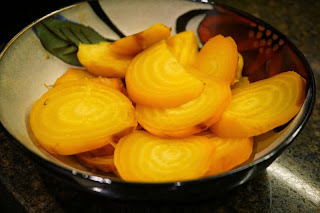 Particularly, golden beets because they have a mild and sweet flavor all their own. It helps to buy beets of similar sizes, if possible. I tend to choose medium-sized beets because they roast in about an hour to an hour and 15 minutes. First, preheat your oven or toaster oven to 400 degrees. Then, wash each beet well, scrubbing off excess dirt. Wrap each beet individually in foil (I wrap them with the shinier side in). 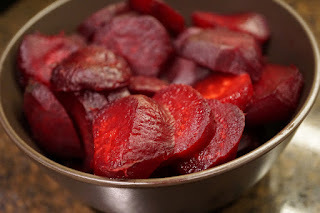 Place the foil-wrapped beets in the oven and roast for about an hour to an hour and 15 minutes. Let them cool before removing their skin. It should slide off easily if the beets are cooked well. After removing their skin, slice the beets into 1/4-inch slices, then serve!